Queen of Grunge - Artwork by Gerrie Johnnic: Creative Inspiration Paints Celebrates it's First Birthday! Creative Inspiration Paints Celebrates it's First Birthday! Creative Inspirations Paints, makers of paints that "shimmer", is celebrating it's first Birthday with the addition of a LIMITED OFFERING of new colors, Ivory, Burgundy, Denium and Beige. The Limited Edition colors are available for $2.25 each, or you can buy the set of 4 for $8.00. To celebrate the designers are having a BLOG HOP with some BLOG CANDY!!!!! Get ready to play and win! 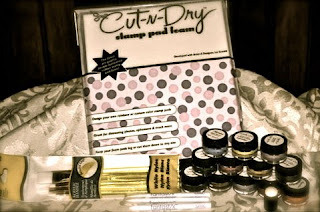 You should have arrived from Ashley's blog, if not, you'll want to start at the CIDT Blog. Here is the FABULOUS prize you can win...........all you have to do is visit every one's blog, leave them some love, and pick up the letter that each of the players has noted on their blog. Enter on the CIDT Blog by leaving a comment and the winning word, and you will have a chance to win (note comment moderation is enabled on the blog so you won't see your comments appear). By the way, the prize contains 12 beautiful paints, your choice of colors! How great is that!!!!! You have until Wednesday, August 18th at midnight to enter. And now for my card....I used ALL the new colors on my flower, they are just beautiful. The card has unbelievable shimmer. 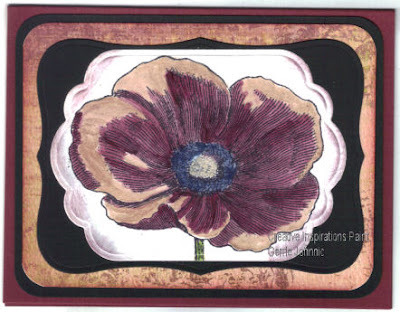 My flower petals are painted with Burgundy and Beige, the stamp is by Hero Arts. I used the Wisped Frames tech from the TJNL on my Nesties. Ooooh, Pretty! Gerry, this is fabulous. The flower really is beautiful and shows off the paints gorgeously. LOVE the card! The flower is just beautiful!! Great job! Delightful flower. Just lovely how you used the paints! Have a nice Sunday! Beautiful flower, the paints not only added shimmer but wonderful dimension! You've showcased these paints beautifully! Fabulous artwork! Lovely depth in your card! WOW! This is so unique - and beautiful. Love how you framed it too. Just wonderful. Gorgeous flower and loved how you colored it. A beautiful flower. This has been a fun hop. Wow! What a nice card. These paints look wonderful! Gotta try them. oh, that's beautiful Gerrie!! It's been too long since I've visited - you've been rockin'!! Gorgeous work. What amazing detail in your flower. This is a beautiful card! What rich colors for that beautiful bloom. WOW! This is so cool! I love what you did with the flower! That stamp intimidates me! Wow Gerrie, love the flower and how you brought it out with the paints. Very pretty! to have 12 colors of my own!